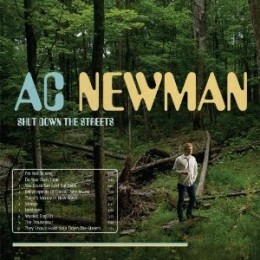 CD Review: A.C. Newman, "Shut Down The Streets"
On his latest, the New Pornographers ringleader gets real. Even if it had been sung by someone else, you know instinctively that “Encyclopedia of Classic Takedowns” was written by the person that wrote “My Rights Versus Yours” and “Use It.” In what seems like a relatively brief time period, A.C. Newman has carved out a special niche for himself in rock music. It’s probably important to note he’s been at this for a couple decades now, first with the band Zumpano and then with the group for whom he’s known best, The New Pornographers. The best part about Newman’s technique is that he is no great fan of plain pop structure. Sure, he may hit a tried-and-true melody line with frequency but he almost always follows it up with chords you weren’t expecting. Therefore, that slightly weird feeling of hearing brand new songs (from most artists) that are so rudimentary and slavish to pre-programming and knowing exactly how the song goes from the very first listen is not an issue with Newman’s compositions. What can be problematic, at least with the New Pornos stuff, is that the lyrics tend to be knotty and distant, feigning vulnerability rather than reflecting it. That is not a problem with Newman’s third solo album, Shut Down The Streets. “Encyclopedia” has been tagged as being the most “New Pornos-sounding” and those who say so are correct, but just barely. If you as listener have been taken by the recent material from albums like Challengers and Together, you’ll like Shut Down The Streets a lot. Newman, after all is tagged and named, can’t help but sound like Newman. Backing up this time is bandmate Neko Case (who is on virtually every song on the ten track release), making the disc sound even more of a piece with his body of work, but then you notice that some things have changed. Newman’s lyrics have never been quite so succinct and on-the-money, and that is an important distinction from previous solo efforts like Get Guilty. On that record he was backed by another favorite of mine Nicole Atkins, but the words to the songs maintained the distance he commonly held with his band efforts — in short, the album felt like a New Pornos album, only without Dan Bejar’s contributions. Shut Down The Streets, on the other hand, does feel like a solo album and a solo statement. All the songs retain memorability, but none more than the title cut that closes the album. In that, Newman expresses the feelings that everyone who has experienced the loss of someone important to them feels. In a real sense, the “whole world” comes apart for the mourner and it feels only right that the whole world should pay respects to the deceased. Yet the loss is only experienced by a handful of people and that frustrating reality of life going on, without deference, is disillusioning. Newman gets it with a series of vignettes of what people should have done at that solemn moment. Now I’ll admit this probably reached me more because I experienced such a loss recently, but I think Newman has gained a newfound appreciation for a more direct form of songwriting. We’ll see if it carries into The New Pornographers or not. Some may not appreciate Shut Down The Streets because of these decisions, but I would suggest you stick with it and it will grow on you. If you are a fan of A.C. Newman, you can’t go wrong. Even at his most sincere, he still sounds like A.C. Newman, and that’s always a good thing.